With a modest amount of Kin activity in-game this past week (we actually ran instances together! ), and with the reinvitation of Kairos to our ranks, a meeting seems in order as we look to kickstart TWA in LotRO. Our kin activity dissolved around Rohan due to a lack of group and endgame content. Anyone who has played LotRO since we entered Gondor at level 100 two years ago can attest that Turbine, and now Standing Stone, have addressed that imbalance. The impetuous is there friends to get going, and eventually raiding, again! So lets use this thread to organise a meeting to discuss future plans. I invite any players, past or present, to attend. As well as those of us who are logging regularly, I urge any past players to redownload the game and see for yourself how LotRO has returned to fine form. I personally don't think the game mechanics, instances, quests and general gameplay have been this good since level 75, and Mordor and Erebor are brilliant fun. That would be great! LOTRO seems to be doing fine at the moment, I find lots of stuff to do every day. How about Sunday 10 June, perhaps sometime between 1.00 and 4.00 pm UK time? That should give enough time to contact members who don't drop in very often. If that doesn't work, I can be available pretty much and day or time from Friday 8/6 onwards, given adequate warning. We should probably take a look to see which of the old TWA members (and Friends) are still active in the game and send them an invitation as well. I was also thinking of perhaps posting a callout on the in-game world chat channel a few times. Sunday 10 June at 4 pm UK time is fine for me. Sounds good. I'll be there. We’ll be using Discord, our new (relatively) voice chat, for this meeting. It has a pretty cool client for Windows and iOS. (05 Jun, 18, 14:31)Eresmir Wrote: We’ll be using Discord, our new (relatively) voice chat, for this meeting. It has a pretty cool client for Windows and iOS. not sure if I'm doing all correctly, I (seemingly) joined TWA server, but can never see if anyone is online, can't change my nickname for that channel and there is no text chat avaliable, see screenshot. 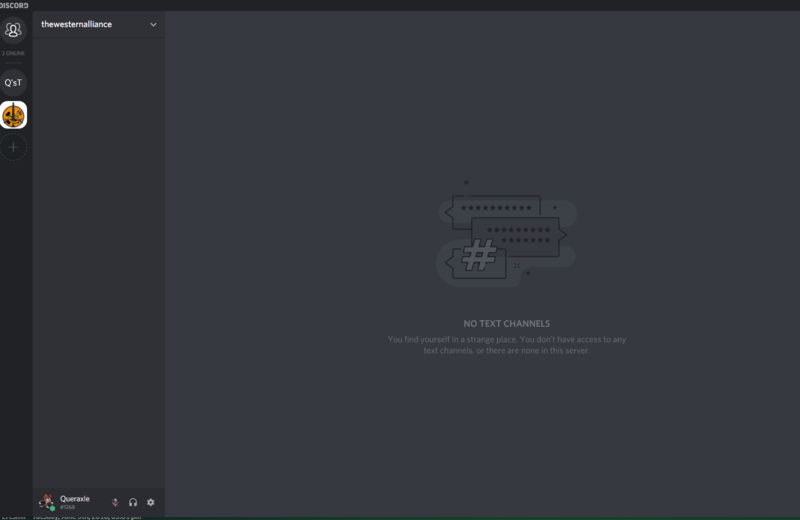 Is this as intended (I'm pretty new to discord)? That’s strange when the invite is for the lounge channel. Did you use the link above? I’ll check our settings to see if it’s a permission thing. What username are you using? Should be fixed. Was a permission thing for non-members!